Step 1. 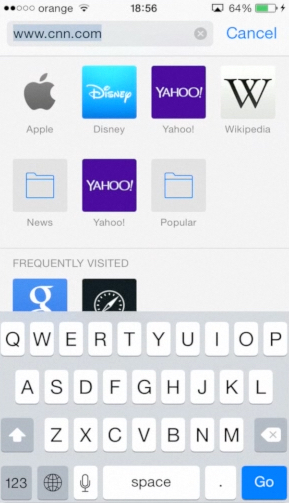 Go to your Safari app at the bottom of your screen and enter the address of any website that you want to visit. We’ll choose CNN News website. Step 2. Now comes the tricky part: iOS8 does not suggest the desktop version of the website right away. Instead you’ll have to perform the following operation: tap on Safari’s address bar. You’ll be shown your usual list of Frequently Visited websites. But it’s not everything! Step 3. Swipe that page down to uncover “Add to Favorites” and “Request Desktop Site” version. Step 4. 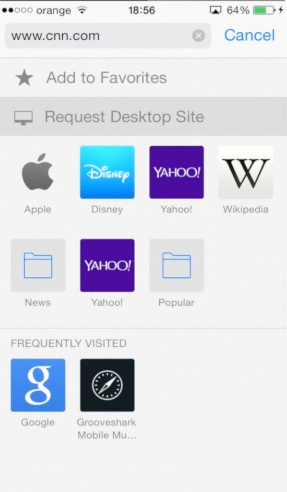 Tap “Request Desktop Site”. 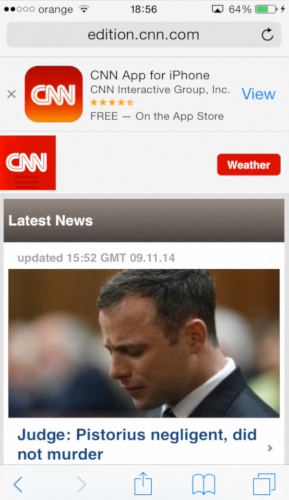 We are now shown the desktop version of CNN website – the one we’re so much used to! It looks great in a horizontal Landscape mode. Result: You’ve just learned how to request desktop version of any website in Safari on your iPhone running on iOS8.